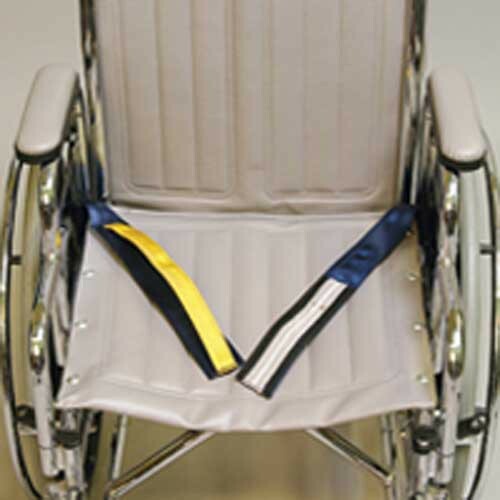 Made to fit almost any wheelchair or geri chair, the Posey Velcro® Alarm Belt Sensor is a useful and safe device that reminds patients to call for assistance before they ambulate. The device uses adjustable securing loops to attach to the chair and uses a hook and loop strap for fastening the two ends of the belt together. One of the more unique features of the sensor is the use of conductive fabric as the switch mechanism. This system allows for reliable detection of open or closed belts with the use of extra cables or clips. The belt can easily be transferred to another chair and is completely compatible with the Posey KeepSafe, the Sitter II, and the Sitter select alarm units. For ease of use a large yellow strap is attached to the sensor, whose large size aids patients in releasing the velcro alarm belt sensor by themselves. Please note that the Posey Velcro® Alarm Belt Sensor is a wipe clean only product. The Posey Alarm Monitor is sold separately from from the belt sensor.